Cyanogen team’s Koushik Dutta has been one active user who has been working on the different things for the Chromecast, and after a few weeks of teasing of the Mirroring of the Android screen, he is able to get it to work on the Nexus 5 smartphone whose screen can be mirrored to the Chromecast. 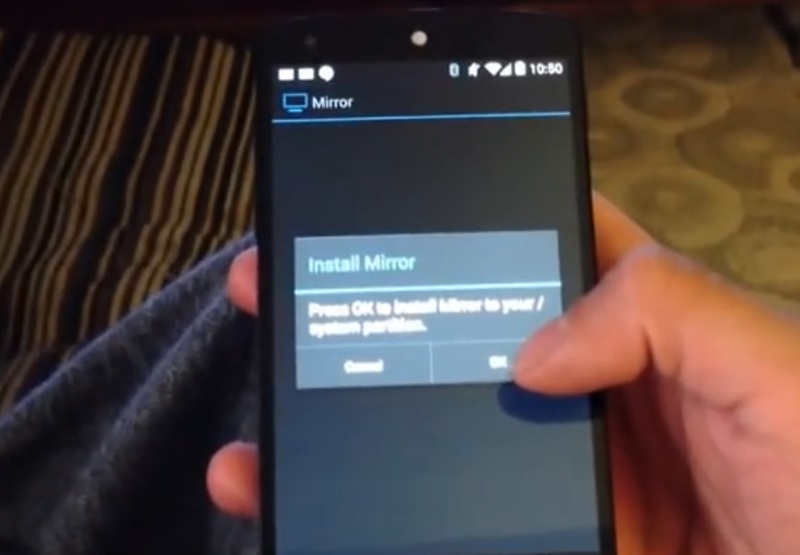 The Mirror for Android beta is now getting an update where the users would now be able to mirror the smartphone screen to the Chrome browser or to the Chromecast. Chromecast support is super beta. Only works on Nexus 5. This is because Nexus 5 is the only phone on the market that has a hardware vp8 encoder. At some point I’ll get Mirror wrapped up for a proper Play store release. Got a bunch of other stuff I need to fix first. Now, talking about the Mirror for Android app, here is what it would be able to do. So using the Mirror for Android app, you could just show the screen directly to the larger TVs with the Chromecast without any other connection required. The Chromecast streaming earlier was limited to only a few apps like Youtube, Netflix etc. but at least for now, the Nexus 5 is a device which can be used to do a lot more than you expect.